A night full of awards and amazing journalism. Congratulations to the BizWest Media team! I’m proud to have been a part of it for the last nine months. 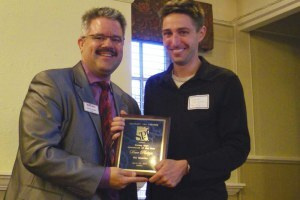 SPJ Colorado Pro chapter president Dennis Huspeni, left congratulates Pulitzer Prize-winning reporter Dave Philipps of The (Colorado Springs) Gazette, who received the Journalist of the Year award at the Top of the Rockies Awards presentation. We will mail certificates to you folks who couldn’t make it (hopefully in the next week). Thanks to everyone for making it a great contest. Pulitzer Prize-winning reporter Dave Philipps of The (Colorado Springs) Gazette received the Journalist of the Year award Friday from the Colorado Pro Chapter of the Society of Professional Journalists.